The Samsung Galaxy S7 Oreo update roll out is in full swing, but there's one member of the S7 series that's yet to get the Oreo update: Galaxy S7 Active. Newly unearthed evidence suggests the upgrade for that one is just around the corner. 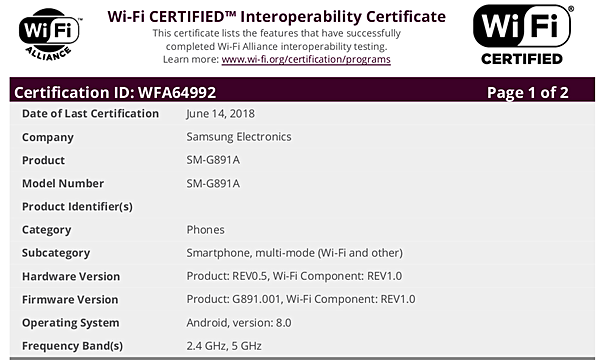 The phone with Android 8.0 on board has been spotted on the website of Wi-Fi Alliance. So this is usually a strong indication that the update roll out is imminent. Sadly, an exact date is currently not known, but the wait can't be long. Stupid auto correct. The S6 and S6 Active is what that is supposed to say. It will depend on your carrier if they release it to you or not. You are incorrect. It has been announced the S7 Active will get Android 8. Thank you for trolling though. It's a pity that the most amazing and unique Samsung phones are single-SIM and are sold in the US only.